Ceres was the first asteroid to be discovered. It was discovered by Giuseppe Piazzi in January 1801. 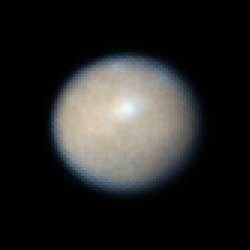 Ceres is the largest object in the asteroid belt. Ceres is the first and only asteroid promoted to dwarf planet status. This occurred in 2006 when the International Astronomical Union voted to add this category as a consequence of reaching a final determination as to the planetary status of Pluto.